This easy Turkey Tetrazzini is a classic family recipe! 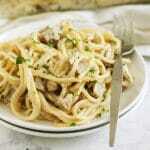 This is the best way to use leftover Turkey from Thanksgiving but is also great made as Chicken Tetrazzini. It's creamy but still light and delicious- the ultimate comfort food! Cook the spaghetti to al dente as per the package directions. I removed it a minute or two before the al dente time listed on my package since it will cook more in the oven. Drain and set aside. In a dutch oven, melt butter. Stir in flour to make a roux and then add chicken broth, stirring constantly until the sauce has thickened. Remove from heat and stir in the half & half, sherry, parsley, salt, nutmeg, and pepper until well combined. Taste for seasoning and adjust if necessary. Toss in the pasta, turkey and mushrooms with sauce until everything is well coated. Turn the mixture onto a 9" x 13" pan and sprinkle with the Romano cheese. Bake for around 40 minutes or until bubbly and thoroughly heated. Sprinkle with chopped parsley and serve immediately.